Sigma was nice enough to send Midwest Photo a rare advance copy of the ground-breaking Sigma 24-35mm f/2 Art Zoom Lens. We have some of the first test photos from this lens and we will continue to update you with the latest images for the next couple of days! Needless to say, we are super-psyched. Sigma has put a ton of engineering into this lens and it shows. Sigma describes on their site some of the features of this lens, and some of the technology they used to get it to the performance standards that shooters are accustomed to from the Sigma Art series. Click on any of the images to see full res versions! My first impressions of this lens wide open at f/2 is that it is nearly flawless. At the very least, Sigma has proven that you can make a high quality zoom lens with a faster-than-f/2.8 aperture. 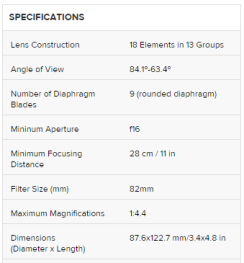 The Sigma 18-35mm F1.8 DC HSM Art Lens surprised everyone with the announcement, and, subsequently, with its overall image quality. We are now in an age where zoom lenses are not only approaching primes in image quality, but also in aperture speed! I think everyone that carries around a bag full of lenses has had the idea of a fast zoom lens that could replace their bag of primes. Up to now, that was just a dream. Personally, I love prime lenses and I am curious to see if this lens could make me consider a zoom lens replacement for some of my prime lenses. 1-2000 sec at f – 1, ISO 800. I will give a full review of this lens after a little more time with it, but I will share test images every day this weekend, so stay tuned and subscribe for updates to see how this innovative new lens holds up to all sorts of shooting situations. 1-800 sec at f – 2.0, ISO 100. 1 to 1 crop of previous image. Wide open. So far the images are super sharp, with stunning color and great contrast. All the images below are minimally edited in Lightroom CC, from Canon RAW files from a 5D Mark III with just basic processing. Let us know what you think! 1-2500 sec at f – 11, ISO 800. 1-250 sec at f – 7.1, ISO 100. 1-4000 sec at f – 2.0, ISO 200. 25.0 sec at f – 5.6, ISO 800. TJ Hansen is a videographer from Columbus, Ohio who also works at Midwest Photo Exchange. You can see more of his work at gingerattack. This article was also published here and shared with permission. Not really a great test of this lens, does not really show what it might be capable of sadly. I am really interested in seeing more “bokeh” examples. I own the 50mm 1.4 ART and LOVE IT! I was thinking about buying the 24mm or 35mm when the news of this lens broke.